Starting in October, Thursday nights on Adult Swim will be *the* place to get all the most compelling celebrity interviews and watch as the hottest Hollywood scandals are exposed with the return of The Eric Andre Show and the new series premiere of Hot Package. 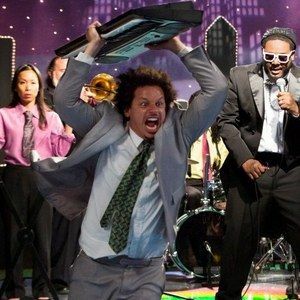 The Eric Andre Show triumphantly returns with a brand-new season of depraved anarchy and rabid mayhem. Already the most subversive and unorthodox late-night talk show ever aired, Eric André and his profoundly apathetic co-host Hannibal Buress up the ante for season two with bigger guests, badder destruction, and bolder interactions with the public at large. Guest stars Dominic Monaghan, Brian McKnight, Eric Balfour, Henry Rollins, T-Pain and many others join Eric this season as he breaks down the walls of sanity on television. The Eric Andre Show is produced by Abso Lutely Productions and executive produced by Eric André, Andrew Barchilon, Kitao Sakurai and Dave Kneebone. Premiering immediately following The Eric Andre Show on Adult Swim, Hot Package is a live-action fictional Canadian entertainment news program in the vein of Entertainment Tonight, Extra or E! News. Hot Package is created by and stars Derrick Beckles, produced by Abso Lutely, and executive produced by Derrick Beckles and Dave Kneebone. Coinciding with the launch of season two of The Eric Andre Show, the alternative-variety show takes its DIY brand of late night entertainment and punk-rock comedy on the road. Just like on the screen, Adult Swim Presents: The Eric Andre Show Live! will feature spontaneous performances including musical guests, real and fake celebrity appearances, and all of the demented antics fans of the series have come to expect. Throughout November, Eric André's US tour will descend upon the luckiest of cities, leaving a trail of destruction behind in his wake.